The question ‘Who Am I? is possibly humanity’s number one frequently asked question, a question that probably produces more possible answers than there are stars in the sky. I have asked myself this question many times in my life so far, and explored many of the recommended methods that are supposed to help one find an answer. These methods have ranged from world travel to travelling the inner worlds, and this website is an attempt to document some of my experiences during this exploration. But here I offer some of my ideas about who I am now. I am a spiritual being having a human experience, as I believe are all of us. 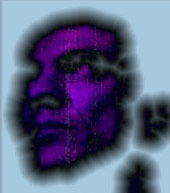 I am a virtual reality computer game avatar in a vast holographic 3D virtual world, where the players – many of whom created the game in the first place – have handed the remote control to the avatars, so soon after the avatar’s entrance in the game that most avatars are not aware of the existence of the player. Although I would lend credence to many of the ideas of the so-called New Age movement, I no longer consider myself purely as a lightworker, having had to learn to work with the darker aspects of my soul in recent years! But I am not just a darkworker either, I consider that both of the light and dark polarities are different manifestations of what is basically the same energy, so I would rather call myself an energy worker. Despite some of my lyrics in The Love Frequency, I am not sure that the term ascension – the idea that one spiritually evolves moving up through the dimensions until one can finally throw off this mortal coil and become purely spirit – is fully appropriate for the pathways I find myself on. I certainly believe it has been important in our understanding of the whole process of spiritual evolution, but these days I find myself more aware of a process of descension, that of my soul or higher divine self in the gradual process of ‘descending’ into my physical body. Because of the soul’s inherent multi-dimensionality, I am becoming more aware of the different dimensions but not in the sense of ascending through the various levels so much as being aware – from my physical centre – of dimensions intermingling with each other. I wonder that in some ways the focus of many on ascension is a stepping stone – or perhaps a hangover – from the Christian idea of the rapture. It still has the idea of physical reality being something somehow considered as low consciousness and something that needs to be moved beyond. It is often suggested in many of the channels of the Crimson Circle rather that physical existence is in some ways the highest ladder on the rung that existence or All-That-Is has seen so far, and that there are angels and spirits simply clamouring to come here. In order to evolve, one must enter and master the Earth realms, over may lifetimes. The soul guides the ‘lower’ human ego to gradually evolve its awareness to the point that the soul feels welcomed by the human to merge with it, momentarily at first but gradually increasing to the point where it becomes the norm.